Teachers may photocopy the reproducible pages in this book for classroom use. It happens all the time. Students receive an A on Friday’s spelling test and then misspell many of the same words in their writing on Monday. Teachers are frustrated that their students can’t spell. What is the solution? Practice, practice, practice! Teachers want spelling practice to be simple and easy. 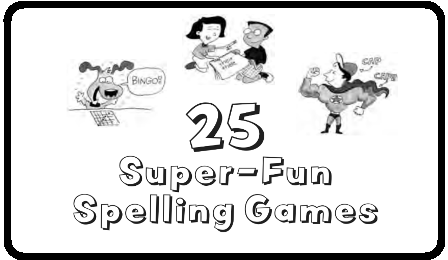 Students want spelling games that are motivational and fun. Here are 25 games that are fun, easy, and, most important, effective. The ability to spell well is a sign of literacy. Spelling is a skill of constructing words rather than memorizing them. A good speller predicts how a word is spelled based on knowledge of what is probable in English. Sadly, spelling is one of the most neglected subjects of study. At all grade levels, students benefit from direct instruction and frequent practice in spelling.